Most of us, whether we are kids or adults, whether we like it or not, are sitting in front of the computer for long durations. We are either working, playing games or simply surfing for information. The last few decades have seen a massive explosion in computer and web technologies as well as use of computers. Today we just cannot think of a world without computers and internet. But with the increase of its use, we also see a rise in the injuries due to the excessive use of computers in our life. Terms like Repetitive Strain Injury or computer related injury are getting common. People are using keyboards and touch screens to communicate, work and even get entertainment. The repetitive motion of sitting and typing in a fixed position can lead to significant injury and pain. There are people who work for more than 8 hours a day and for some such work hours can stretch to even beyond that. The repetitive stress can lead to injury and pain in elbows, arms, wrists, fingers etc. These stresses on the body can impact everyone, whether we are leading an active lifestyle or a sedentary one. Many people even have to leave their job because of these computer related injuries. As a result of Repetitive Strain Injury, many people have been known to get even disabled permanently. Nevertheless, an awareness regarding these issues is gradually spreading and people working on computers are getting more educated about these issues, and pains, due to overuse of computers. It is essential to educate people on the right use of computers and how to prevent these computer related injuries. Thousands of repeated keystrokes and clutching and dragging the mouse for long times have resulted in an epidemic of injuries in the arms, hands and shoulders. 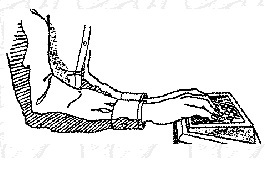 Certain typing techniques and body positions place unnecessary stress on the nerves and tendons in the hands, wrists, arms and shoulders as well as neck. No breaks and lack of adequate rest are sure to invite these troubles faster. Let us see how you can minimize the risk of these computer related injuries and prevent Repetitive Strain Injuries. Keep your elbows bent at 90-degree angles and the wrists straight. Make sure the fingers rest softly on the keyboard. Make sure you don’t have to force out your fingers on the keyboard. Keep your wrists and fingers at the right level with your forearms to sit in the right position. You need to be careful if youwrists are getting hurt and feel pain in the night. It is essential to pay attention to how you sit as you will be in that position for long working hours. Your back should be in the center of the seat and legs should rest on the floor, bending at the knees. For kids, make sure to have proper footrest when they sit on the computer. 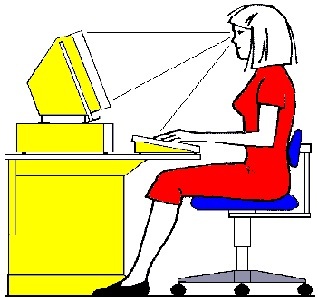 Do not lean over the keyboard or slouch while typing. Here are some extra tips to keep in mind to prevent those injuries related due to the computer. Take breaks after every 15 minutes. Take your eyes off the computer screen and relax them. Rotate your arms after some time when working. Shrug your shoulders and relax them from time to time. Stand up and stretch your back. Take it easy and visit physiotherapists or your health professional if you see any sign of computer related injury.